I watched 28 DAYS LATER (2002) on 10.25.15. It was my third viewing of the film, and my first in over ten years. 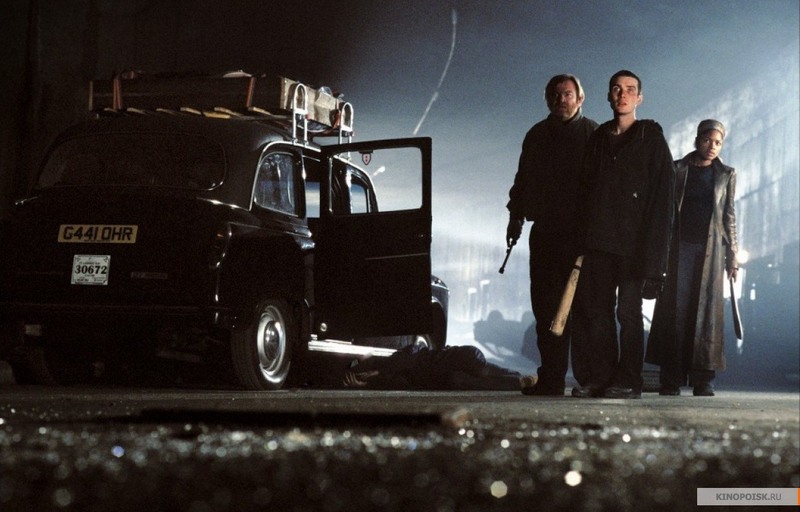 All of today’s popular zombie tv shows and movies – those we consider the modern era of zombie stories – owe a bit of thanks to 28 DAYS LATER. The genre of the zombie film was mostly defunct, relegated to the 90s filled with NIGHT OF THE LIVING DEAD sequels and rip offs. Heck, it is arguable that the best zombie movie of the 80s and 90s might have been WEEKEND AT BERNIE’s, and that is only a mildly disingenuous statement. The zombie movie pre-2002 was, ahem, dead on arrival. 28 DAYS LATER single handedly brought it back, with the immediate aftermath of DAWN OF THE DEAD, SHAUN OF THE DEAD, ZOMBIELAND, and (of course) TV’s WALKING DEAD all owing a bit of a thank you for the resurgence to Danny Boyle’s film. And the craziest thing about that? 28 DAYS LATER isn’t even really a zombie film. Technically, the zombie-like creatures aren’t really dead. They are infected with blood from a disease called ‘Rage’. They turn from human to whatever else in a matter of seconds, and they thirst for blood immediately. They sure owe their origins – literarily speaking – to zombies to be sure. But they wouldn’t be classified the same way. What Danny Boyle’s film did, though, was remind people of how scary zombies when done right. These villains run – a revelation when this came out – and they are dangerous. The characters owe a lot to zombie films, and so does the plot. The plot centers around some survivors, starting 4 weeks after the first day of the viral infection hitting humanity. Jim (Cillian Murphy) wakes from a coma to find London nearly empty. He stumbles upon a couple of survivors, and he forms a bond with Selena (Naomie Harris). Those two end up working alongside a father and son team (Brendan Gleeson and Megan Burns), and soon the four head off to the promised land of a military stronghold days away by car. When they get to ‘safety’. they end up with a group of loosely led men who have an ulterior motive. Their boss, Major West (Christopher Eccleston), who seems like a reasonable guy on the edge of cracking. And if he is on the edge, his men have mostly already fallen over the precipice. What starts as a movie about a docile man, Jim, trying to survive horrifying circumstance ends up as a movie about a man, still Jim, who has to endure and embrace his horrifying side in order to survive. The movie does a lot well. There are true moments of joy to counteract the genuine moments of terror. The music is nice. The acting is very solid. The plot is a unique look at the post-apocalyptic survival story as well as an allegory about what men become in the age of lawlessness. It is a movie willing to provide hope only to squash it moments later. Really, this is good stuff. What may ruin it for modern moments was a decision made before the film started shooting. Director Danny Boyle made a choice to shoot this thing in a lower resolution format using the Canon XL1 digital camera. This may have been cutting edge in mobile camera technology in 2001 when this was shot, but the images don’t take well to high resolution. The Blu Ray looks like a VHS – and that is an intentional look. Back in the early 2000s when people first viewed this on their tube TVs in the early days of DVD, this may not have been a huge issue. But with the standard of movies – even older movies – so much higher now, watching this feels like watching a movie that is constantly buffering. The images are not clear, and the shots are grainy. Sometimes this can look beautiful, and the viewer certainly is able to make a bit of an adjustment as the film goes on, but there is no doubt that the movie looks nowhere near as good as its contemporary films. 28 DAYS LATER is a movie too good to be held back by this flaw – one which could not have been predicted by the filmmakers back in the early 21st century. While the look of the film may not be a disappointment, the movie at large is not. Negative bonus point is for, you might have guessed, the visual aesthetic of the film. It is just too grainy and low definition to hold up today.